Since 2006, Bolivia has shown leadership to the world on how to tackle the most profound challenges of our time. We have achieved the approval of the Human Right to Water and Sanitation in the United Nations and promoted a vision for society based on Vivir Bien (Living Well) rather than consuming more. However there must be coherence between what we do and what we say. One cannot speak of defending Mother Earth and at the same time promote the construction of a road that will harm Mother Earth, doesn’t respect indigenous rights and violates human rights in an “unforgiveable” way. It is incomprehensible that we promote a World Conference on Indigenous Peoples at the United Nations in 2014 if we don’t lead the way in applying the principle of “informed, free and prior consent” for indigenous peoples in our own country. The Eighth Indigenous March has some incoherent and incorrect demands such as those related to hydrocarbons ant the sale of forest carbon credits that look to commodify Mother Earth (known as REDD). However their concern for the impacts of the construction of this road is just. 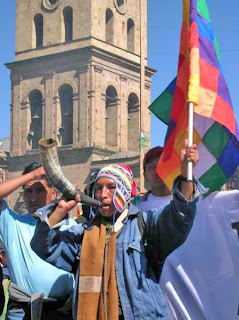 Thousands of the delegates of five continents who participated in the first World Peoples’ Conference on Climate Change and the Rights of Mother Earth are deeply upset by the Bolivian government’s actions. The conflict in TIPNIS should never have happened. Greater physical integration of the country is necessary, but does not need to go through the “Indigenous Territory and National Park of Isibore Secure” (TIPNIS). Obviously building a road that doesn’t go trough the park would be more expensive, but trying to save $200 million or $300 million dollars at any social and environmental cost goes against the very principles of the “Living Well”. In order to stop the manipulation of the Right who wish to use this protest to return to the past, we must be even more consistent in defending human rights, indigenous peoples’ rights and the rights of Mother Earth. It’s not too late to resolve this crisis if we suspend permanently the construction of the road trough the TIPNIS, bring to justice those responsible for the repression to the indigenous march, and open up a broad and participatory national and regional debate to define a new agenda of actions in the framework of the Living Well.